silicon. dimensions: 60 x 80 x 10 micrometers. A 1/1 millionth scale model of Frank Lloyd Wright's Fallingwater, fabricated from silicon using ultra high precision lithography. courtesy catharine clark gallery, san francisco, ca. ``Although the senses occasionally mislead us respecting minute objects, such as are so far removed from us as to be beyond the reach of close observation, there are yet many other of their informations, the truth of which it is manifestly impossible to doubt; as for example, that I am in this place, seated by the fire, clothed in a winter dressing gown, and that I hold in my hands this piece of paper....'' Descartes, Meditations. Wright employed the cantilever: a horizontal structure for distributing force, ``the true earth-line of human life''(Wright). 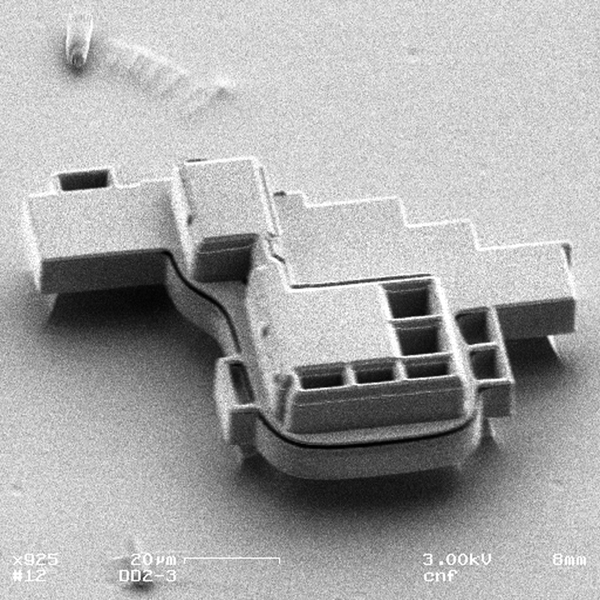 Minature cantilevers are used to measure forces in devices etched from silicon. Examples of current research can be found at many labs including UC Berkeley, Cornell and UCLA. (L) Frank Lloyd Wright's floorplan. (R) CAD model. The flw silicon 3D structure was fabricated using a process known as SCREAM, Single Crystal Reactive Etching And Metallization. The process began by scanning in Frank Lloyd Wright's floorplans from a book. These are then imported into a software package that we use to generate a proportional but simplified 3D model of the building with its cantilevered balconies. This model is then used by the computer to create a sequence of optical masks. Note: the structure is so small that 48 copies fit comfortably into a region the size of a peppercorn. Once the masks are ready, a wafer of purified silicon is treated with a light-sensitive chemical known as photo-resist. In a clean room laboratory, the masks are then used to expose selected areas of the wafer to ultraviolet light, which renders the photoresist susceptible to dissolving in a developer solution. The first mask corresponds to the top floor of the building. The exposed areas of the wafer are washed clean with deionized water, and then a reactive ion etch is applied to the wafer. The etch occurs in a vacuum chamber where chlorine radicals are accelerated by electrostatic fields during a plasma discharge. The ions remove the silicon in unprotected areas, leaving only the patterns defined by the photoresist. The etch cuts deep into the bulk silicon, creating 3-dimensional structures. The lithographic procedure is then repeated with the next mask, etching downward from the top floor to each lower floor. Each etching procedure takes several hours including the lithography and cleaning steps. 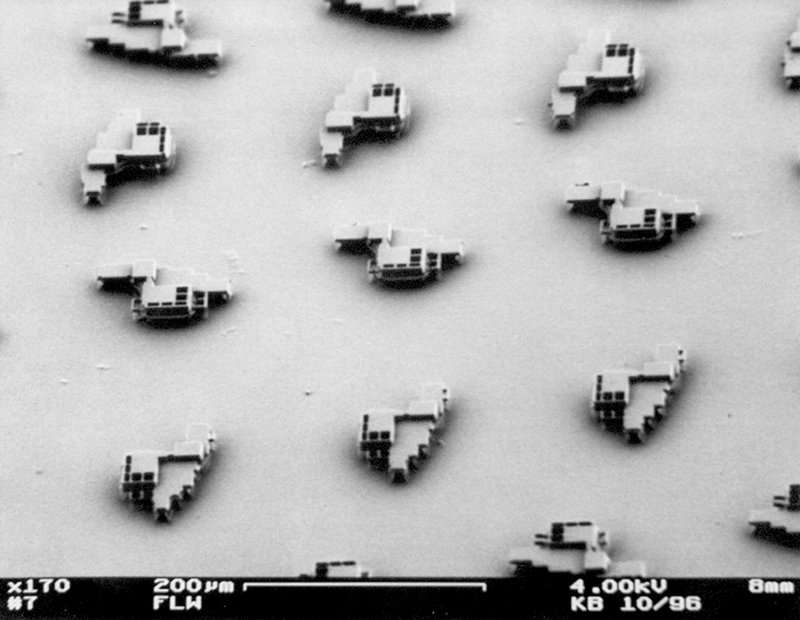 A final plasma etch with sulfur-fluoride ions is used to undercut the silicon, creating the suspended cantilevers in 48 copies of the completed structures. Installation Views, with optical microscope, podium, halogen lamps, and microphoto. Scanning electron microphoto. (magnified 12,000x). Territoires Invisibles. Maison Europienne de la Photographie, Paris. Curated by Henry Chapier and Jean-Luc Soret. Sept-Oct, 2007. Edge Connections, San Jose Museum of Art. Curated by Steve Dietz. Aug-Nov, 2006. Exploratorium Special Exhibit. Curated by Pam Winfrey. San Francisco, CA, Nov, 2005. Tech Museum of Innovation. San Jose, CA, June-July, 2004. Infotecture. Curated by Jenelle Porter. Artists Space. New York, NY. May 2002 - July 2002. Real World. 16 Jan-1 Mar 1997: New Langton Arts, SF, CA. Panel on Scale and Structure, with Daniel B-H. Liebermann (student of Wright), Kris Pister, and Glen Seator. Selected Review: Peter Wayner. 8 Rooms, 4 Baths, No Vu. New York Times Sunday Magazine. page 21. March 10, 1996. Thanks to Bruce Donald, Hubert and Stuart Dreyfus, Ann Goldberg, Peter Lunenfeld, Kathy Mancall, Eric Paulos, David Pescovitz, Lorelei Stewart, Peter Wayner, Catharine Clark Gallery, Barbara Hunt, and Jenelle Porter. Contact ken goldberg at goldberg@berkeley.edu.